High-strength composite T2™ Loop is the first block with no metal shackles or rivets. 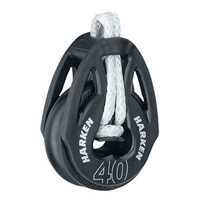 The composite sheave spins on ball bearings with curved bearing races for low-friction rolling. Composite sideplates are fiber-reinforced, high-strength nylon resin. Ball bearings, sheave and sideplates are UV-stabilised for maximum lifespan.